Last Stop on the Lost in a Royal Kiss Blog Tour! I’m rolling into the final station today with my Lost in a Royal Kiss excerpt blog tour–today’s visit is with the lovely ladies at The Romance Dish. Read a new excerpt and enter my contest for a chance to win an ARC of Secrets for Seducing a Royal Bodyguard, my January release. Just click here to join the fun! But the fun and the giveaways aren’t over yet! This Thursday, Dec. 5th, I’ll be hosting a facebook party to celebrate the release of Lost in a Royal Kiss. Several fabulous guest authors will be stopping by, including Theresa Romain and Darcy Burke. There will be giveaways all throughout the party, culminating in a grand prize at the end of the evening. So please join me on the 5th from 7:30 to 9:30, on my facebook page. Just click on the graphic below to RSVP. Just a few more giveaways to tell you about, including the cute tee shirt contest I’m holding with my pal, Theresa Romain. 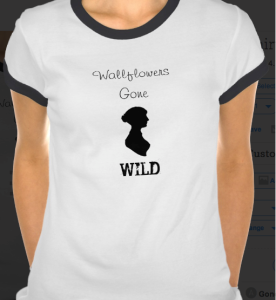 We’re each giving away one of these Wallflowers Gone Wild shirts on our facebook pages. Just click on the tee shirt below for the easy peasy instructions to enter the contest. And finally, please drop by Diana Cosby’s post on my blog yesterday, for a great interview about her new book. She’s also giving away a copy of one of her books in the bestselling MacGruder Series. Guest Author: Jerri Hines & Giveaway! !